Swingsets? Basketball courts? 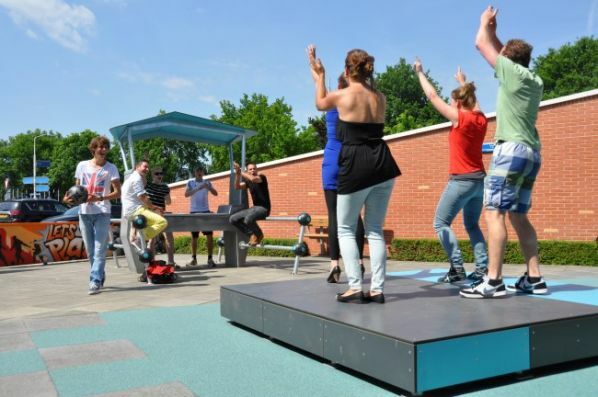 Dutch interactive design firm Yalp imagines populating futuristic public playgrounds with DJ decks and dance floors, for today’s teens. Then, in case you want to dance to the music, there’s the Fono dance floor, which responds to movement with cut-up samples. The team have also devised benches and storage to encourage young people to hang out. Somehow, I think this is all meant to keep kids off drugs or out of gangs by DJing in the playground. I have no idea how practical it is, but it’s certainly technologically interesting. The steel casing makes the whole rig waterproof and, the creators claim, vandal-proof. It’s a very different vision of touch technology than what you get on an iPhone or iPad. And everything is solar-powered. Whether this works as a playground concept, I’m not sure, but it does suggest some possibilities for other outdoor technological interactions in other settings. And the design itself is fascinating – also a winner of the prestigious 2014 Red Dot design award. There’s also a hands-on video and (Dutch-language) interviews, where we learn that DJs really do nothing but wave their hands in the air and the boys won’t let any of the girls play on the decks… which also means the boys are behind the decks while the girls are dancing on their own. Come on, guys. Ahem. Thanks to DJ Xtopher [SoundCloud] for this one. And yes – I agree, it is the new Ping Pong.